With high accuracy, gravimetric feeder can totally satisfy the fields of pharmaceutical industry, chemical industry, food, plastic and rubber and so on. Configurable options can meet factories’ demand in hygiene, explosion-proof, water proof, corrosion environments and other regulation demands. ◆ High feeding accuracy: Batte adds self-detection function when designing its feeders for more accuracy, it allows to detect attritions of parts and frequency variation timely, then revise them. So the feeder will not affect the feeding precision because a little change of the machine. ◆ The touch screen output and input system is humanized and easy to operate. As long as the operate has certain cultural foundation, he can master it within minutes. So short time training is ok.
◆ Wide measuring range: without replacement of parts, you can set wide range flow and realize the conversion of produce process smoothly. ◆ Excellent control system: one control system can control mult-feeders according to clients’ requirements. This won’t affect the accuracy. 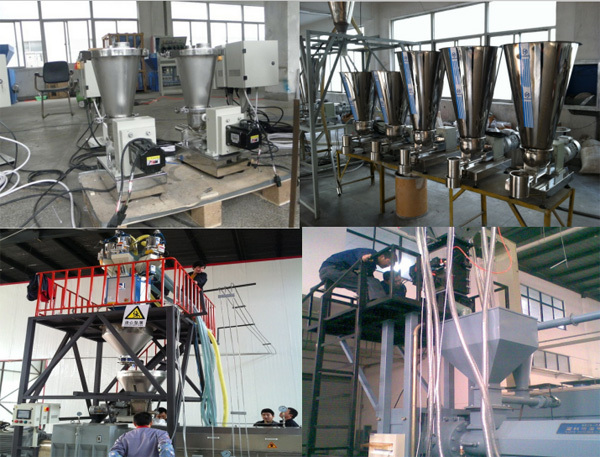 ◆ Batte gravimetric dosing feeders can satisfy the production requirements of masses of customers. With the independent research of kinds weighing chips, the feeding accuracy has been improved from ±0.5% to ±0.2%. The combination between single-chip and PLC control overcomes the problems such as scalability of single-chip control is not strong and precision of PLC operation is not stable. The weightlessness metering feeders’ operation resolution can be ten millionth, two millionth for weightlessness feeders which can meet customers’ high feeding accuracy.